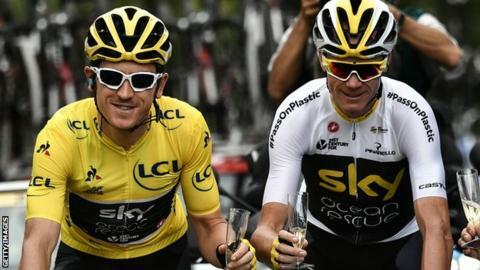 Tour de France champion Geraint Thomas and six-time Grand Tour winner Chris Froome have made themselves available for the UCI Road World Championships. The duo are on a longlist of British athletes from which a squad will be selected for the event in Innsbruck, Austria from 23-30 September. The pair, who compete in the Tour of Britain starting on Sunday, are listed for the time trial and road race. Sisters Alice and Hannah Barnes are also listed for both disciplines. They join 2018 Commonwealth Games bronze medallist Hayley Simmonds in contention for two spots in the women’s time trial. And the British contingent also boasts siblings in the men’s road race, with twins Adam and Simon Yates named. Performance director Stephen Park said: “This year’s road World Championship course is one for the climbers, and I’m pleased to see we have so many talented British riders selected for the longlist whose strengths match the nature of the course. “I’m particularly thrilled that Geraint Thomas, Chris Froome and Simon Yates have made themselves available for selection this year, having made our country so proud in the three biggest races of the calendar. Hugh Carthy, Mark Christian, Steve Cummings, Scott Davies, Owain Doull, Alex Dowsett, Chris Froome, Tao Geoghegan Hart, Pete Kennaugh, James Knox, Ian Stannard, Ben Swift, Connor Swift, Geraint Thomas, Adam Yates, Simon Yates.